The track opened in 1963 and was originally named after Robert Watson who provided the machinery to build it. Although the track belongs to Stowe School, it is within the Stowe Landscape Garden which is a National Trust property. The track is surrounded by trees and is overlooked by the Cobham Monument (built 1747) and the Queen's Temple (built c. 1742) and is a most picturesque venue. It was upgraded to an 8 lane 400m green coloured synthetic track in 2009 with a grass infield and was opened by Seb Coe on 20th September 2009. The new track is named after a 1960s Master in Charge of Athletics at the School. 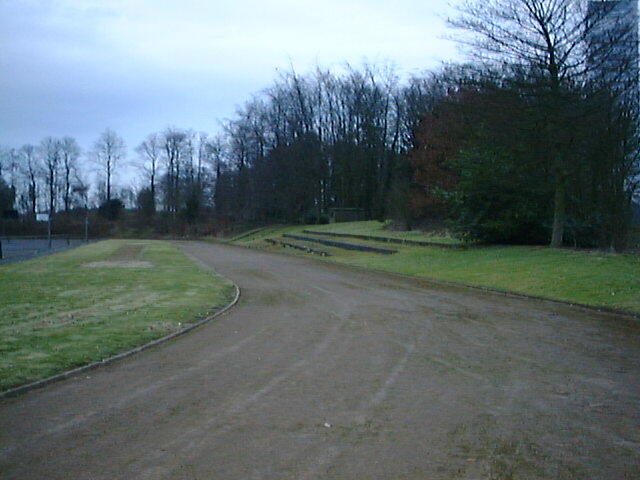 A picture of the home straight can be seen on Geograph. It was previously a 440y 6 lane all round cinder track, having never been converted to metric, and the infield was an asphalt hard-play area for tennis and basketball.